* Animal tracking tags, inserted beneath the skin, can be rice-sized. * Tags can be screw-shaped to identify trees or wooden items. * Credit-card shaped for use in access applications. * The anti-theft hard plastic tags attached to merchandise in stores are also RFID tags. 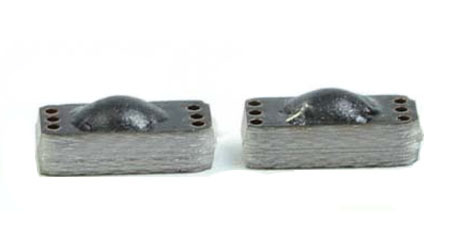 * Heavy-duty 120 by 100 by 50 millimeter rectangular transponders are used to track shipping containers, or heavy machinery, trucks, and railroad cars. RFID devices have been used for years to identify dogs, for a means of permanent identification. Dog owners had long used tattoos, permanent ink markings, typically on the ears. However, these can fade with age and it may be difficult to get the animal to sit still while you examine him for markings. Many musical instruments are stolen every year. For example, custom-built or vintage guitars are worth as much as $50,000 each. OPP IOT, a China company specializing in RFID microchips for instruments, has embedded tiny chips in 30,000 Fender guitars already. The database of RFID chip IDs is made available to law enforcement officials, dealers, repair shops and luthiers. Author rfidchip_@2016Posted on October 31, 2017 Categories RFID TagLeave a comment on WHAT CAN RFID BE USED FOR? I.Eliminates Line of Sight: RFID eliminates the need to position the laser of a scanner across the entire barcode, allowing RFID to be used when the RFID tag is not in direct view of the scanner. This allows users to track and read assets in a sealed container, embedded within the asset or underneath other products/assets in a stack. Barcodes need that line of sight to perform the identification task. II.User Intervention: RFID readers can be installed to read all the time, eliminating the need for an operator to actuate the scan function. Whether installed by doorways, garage entrances or in open areas on manufacturing floors, assets can be read as they are moved, without the user action (unlike barcodes). III.Speed: RFID tags can be read at phenomenal speeds. Asset inventory can be taken very quickly as one RFID handheld can count hundreds of assets in the same time it takes for a single barcode scan. Average inventory counts taken with RFID are 15 times faster. IV.Authenticity / Anti-counterfeit Technology: Unlike barcodes that can be copied and re-distributed, RFID tags have a chip-specific ID value that can be linked with the user programmable ID value. Linking these values together eliminates the possibility of improperly duplicated tags or copied ID values. Product manufacturers, tollways and retailers are embracing this characteristic and utilizing RFID to secure their products and services. V.Writeable Tags: After deployment, RFID values can be written and changed in RFID tags without replacing the tags or removing them from the asset or product. This can be performed using RFID handhelds or installed readers. These tags can be “locked” and “unlocked” with passwords to eliminate unauthorized write operations in the field and protect the integrity of the system. Barcodes must be reprinted and replaced in order to change the value once deployed in the field.It is important to note that while RFID offers several advantages over traditional barcodes, it may not be the right solution for your particular application. Always consider your use case prior to diving into an implementation. Author rfidchip_@2016Posted on October 30, 2017 Categories OPRFID Technologies, RFID TagLeave a comment on WHAT ARE THE ADVANTAGES OF USING RFID TECHNOLOGY INSTEAD OF TRADITIONAL BARCODES? What industries are using OPP IOT metal mount tags? 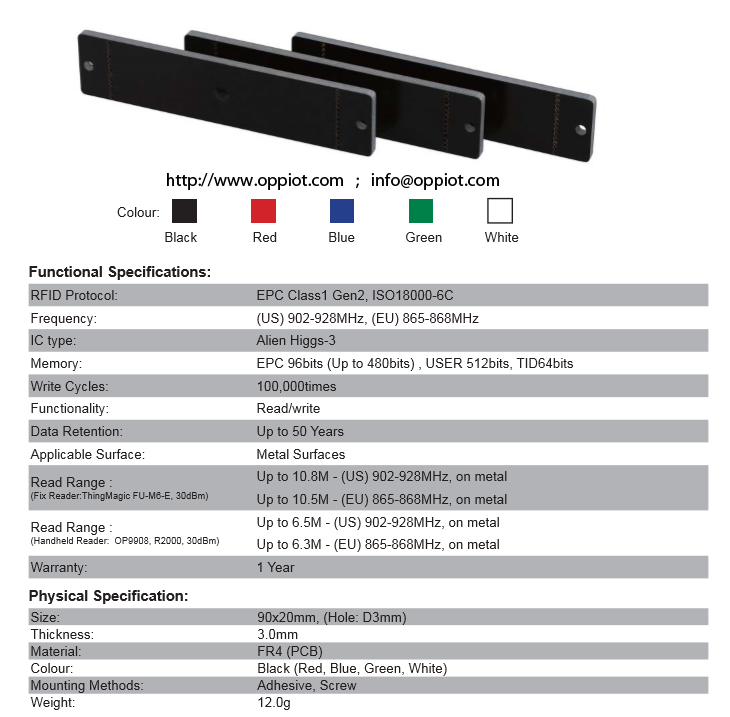 OPP IOT metal mount tags Can Application in industrial area. OPP IOT RFID on metal tags are perfect for asset and tool tracking in medical devices for healthcare, laptops & servers in IT (information technology), industrial manufacturing, oil & gas pipelines, vehicle tracking identification, and many other industry verticals. With the recent developments in RFID technology, the possible applications of metal mount RFID tags are expansive in scope. Author rfidchip_@2016Posted on October 25, 2017 October 25, 2017 Categories application, RFID TagLeave a comment on What industries are using OPP IOT metal mount tags? How Does A Passive RFID Tag Work? Passive tags wait for a RF signal from an RFID reader, RFID reader sends power energy via antenna which converts the energy into an RF wave enough to power on power off RFID passive tag.Once Passive tag is received wave/power within the read covering zone, the RFID tag’s internal antenna draws in energy from the RF waves to make transaction btw reader and passive tag. Author rfidchip_@2016Posted on October 24, 2017 Categories application, RFID reader, RFID TagTags RFID passive tagLeave a comment on How Does A Passive RFID Tag Work? Everest Series are passive UHF RFID tags are designed for use on multiple surface materials including metal. These tags are passive, have read ranges from 280cm to 1080cm and incorporate Alien H3 IC’s with 96 bits of EPC and 512 bits of user memory. The tags operate at 902-928MHz in us,865-868MHz in Eu and comply with the IS0 18000-6C/EPC Class1 Gen2 protocol. Key attributes of on metal tags are long read range, robustness, ability to operate over wide temperature ranges and their ability to be attached to metal objects unlike film tags. The OPP IOT Everest series tags are ideal for asset tracking applications in industrial, heavy machinery, cloud computing, and transportation segments. Abracon also offers antennas for customers that prefer to use their own RFID IC. OPP9020 is specially designed for metallic asset tracking under extremely heat and other harsh environments such as high temperature disinfection,chemical cleaning etc. With up to 10.8 meters reading distance,Widely used for asset management in various industrial fields, such as medical devices,surgical instruments tray, heavy industry, oil & gas & mining,automatic production line,logistic tray tracking,warehouse storage rack, container tracking,etc. 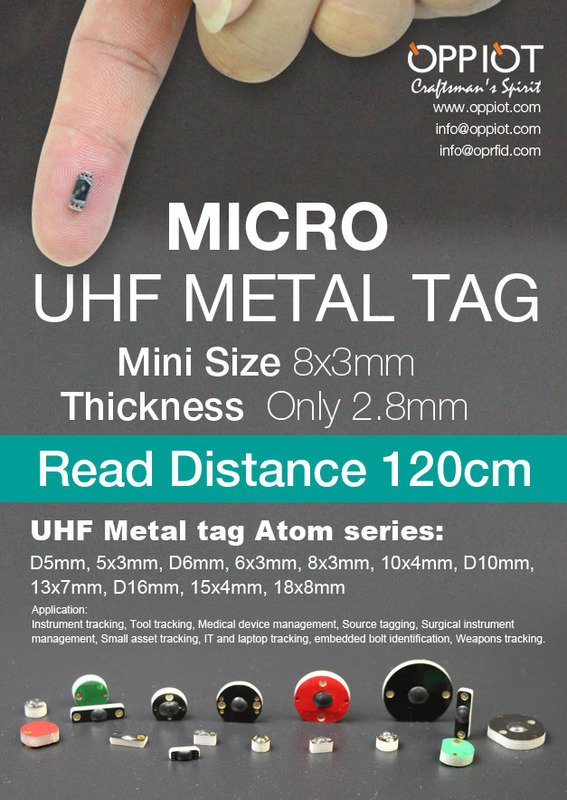 Mini UHF metal tags OPPD16 are designed and produced by special technology and process, for indoor and outdoor usage in harsh industrial environment like metal, acidic, alkaline, wet, etc. It is easy to apply it on metal surface and has excellent performance of being read and written in long distance. We imported original chips of famous brands such as Impinj, Alien, NXP, etc. which is with 860-960Mhz and compliant with EPC Class 1 Gen 2, ISO18000-6C/6B standard. The EM4450/EM4550 is a CMOS integrated circuit intended for use in electronic Read/Write RF Transponders. The difference between EM4450 and EM4550 is that EM4550 are bumped and has megapads for the two coils. The chip contains 1 KBit of EEPROM which can be configured by the user, allowing a write inhibited area, a read protected area, and a read area output continuously at power on. The memory can be secured by using the 32 bit password for all write and read protected operations. The password can be updated, but never read. The fixed code serial number and device identification are laser programmed making every chip unique. The EM4450/EM4550 will transmit data to the transceiver by modulating the amplitude of the electromagnetic field, and receive data and commands in a similar way. Simple commands will enable to write EEPROM, to update the password, to read a specific memory area, and to reset the logic. The coil of the tuned circuit is the only external component required, all remaining functions are integrated in the chip. Available in chip form for mass production and PCB and CID package for samples. 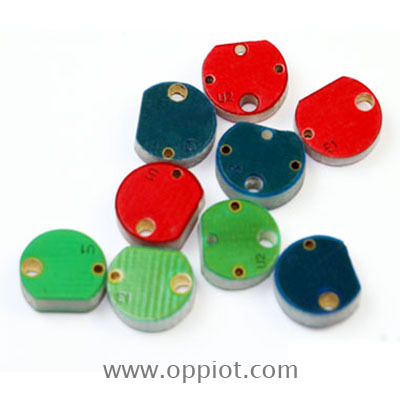 OPP0803 UHF tags is specially designed for harsh industrial applications and temperatures ranging from -40℃ to +150℃. 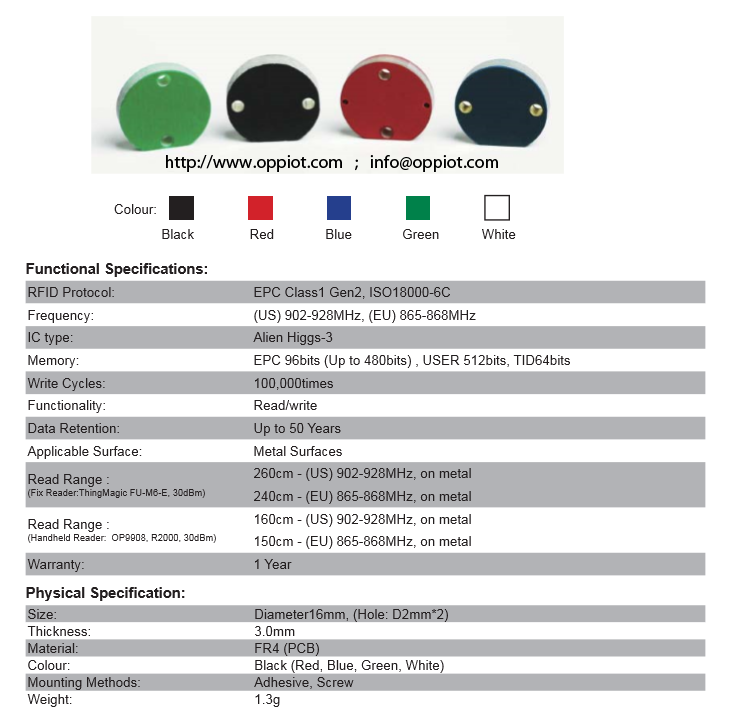 OPP IOT presents a wide collection of high-temperature RFID tags with different protocols design to provide asset tracking even in the harshest environments.OPP0803 UHF tag is specially designed for harsh industrial applications and temperatures ranging from -40℃ to +150℃. Author rfidchip_@2016Posted on October 17, 2017 Categories application, RFID TagLeave a comment on OPP0803 UHF tags is specially designed for harsh industrial applications and temperatures ranging from -40℃ to +150℃.